There's nowhere in all of America quite like Seattle. This seaport city is not only the biggest in Washington, but also the largest in the entire Pacific Northwest region and has become iconic around the world for its unique skyline, dominated by the incredible Space Needle building, and its strong musical associations, helping launch many of the world's most successful jazz and rock musicians. Seattle, nicknamed 'Rain City' and 'The Emerald City', has a lot of stories to tell and a lot of experiences to offer. If you're planning a trip to this beautiful WA city and want to make the most of every single second you spend here and really get the full Seattle experience, one of the best ways to experience the sights and sounds and learn more about Seattle’s history is to take a ride on board The Emerald City Trolley. Emerald City Trolley is the leading trolley tour operator in the city of Seattle, running a range of different trolley tour options for visitors and residents to enjoy. This company runs both public and private trolley tours. Development in the city of Seattle has limited the service of public trolley tours with Emerald City Trolley in recent times, but the company has been offering private charters for special events, tourist groups, weddings, business outings, non-profits, schools, and more, with Emerald City Trolley guides working closely with all guests to create bespoke tours to suit every need. If you’d prefer to hop on board one of Emerald City Trolley’s public trolley tours of Seattle when they’re in operation, you’ll have the choice between two separate routes: the Downtown Seattle Hop On Hop Off Trolley Tour and the Northwest Seattle Tour. Read on for key details and overviews of these two popular trolley tours of the Pacific Northwest’s biggest city. Even if you’re booking a private tour, you might like to know more about the public offerings and use them as examples when considering which route to take. As the name of this trolley tour indicates, the Downtown Seattle Hop On Hop Off Troller Tour runs around the downtown area of Seattle and features a hop on and hop off system in which riders can simply choose to get on and off the trolley at the various stops without needing to pay any additional fares or purchase separate tickets. This trolley tour gives you the full freedom you need to explore the downtown area of Seattle and see all of the big sites, museums, attractions, stores, restaurants, and more. The full tour lasts for two hours and makes 15 stops in total, stopping off right by many of the area's top points of interest like the Space Needle, Key Arena, McCaw Hall, the Seattle Art Museum, Pioneer Square, CenturyLink Field, the Seattle Aquarium, and more. So no matter whether you're looking to explore the Olympic Sculpture Park, visit the 1928 Paramount Theater, or take a stroll along the Central Waterfront area and gaze up at the city skyline, you'll be able to do so with the Downtown Seattle Hop On Hop Off Trolley Tour. Tickets are priced very reasonably and the friendly guides and staff working with Emerald City Trolley will work hard to ensure that every riders has the best possible time. Seattle is home to many of the city's top sights and attractions, but there's much more to Seattle than this one area. 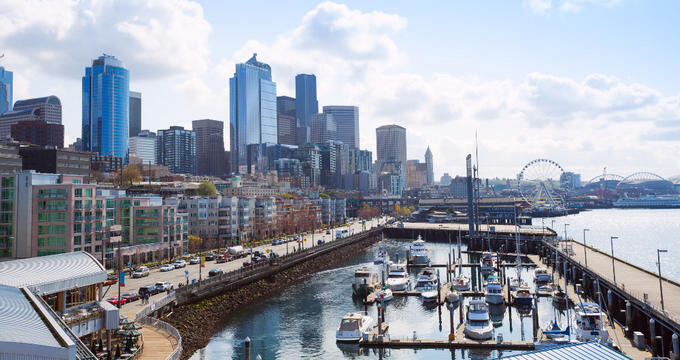 The Northwest Seattle Tour lets you see even more of the city, passing along the shores of Lake Union, heading over towards the University of Washington and Husky Stadium in the northern part of the city and exploring the northwestern side of Seattle in areas like Fremont and Interbay. This tour lasts for three hours in total as it runs a much longer route that the Downtown Seattle Hop On Hop Off Trolley Tour. Some of the top locations you might like to check out on the Northwest Seattle Tour from Emerald City Trolley include Kerry Park Overlook, Gasworks Park, and the Ballard Locks, and you’ll get some really beautiful views of the city’s skyscrapers and waterways along the way. Don’t forget to bring a camera along for the ride if you choose to reserve a spot on the Northwest Seattle Tour as you’ll definitely want to preserve some of the magical sights you see forever more.